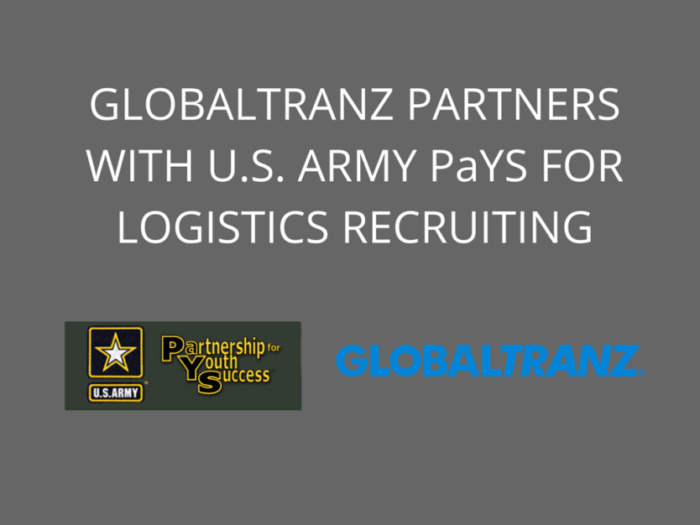 PHOENIX, ARIZONA – March 21, 2017 – GlobalTranz Enterprises, Inc., a leading technology-driven freight management solution provider, today announced it is forming a partnership with the U.S. Army to promote recruiting of soldiers and veterans. The U.S. Army and GlobalTranz are scheduled to sign a partnership agreement March 30, 2017, as part of the U.S. Army Partnership for Youth Success (PaYS) program at 10:30 a.m. at GlobalTranz Headquarters, 7350 N. Dobson Rd. #130, Scottsdale, AZ 85256. The PaYS Program is a strategic partnership between the Army and a cross section of private industry, academia and state and local public institutes. The U.S. Army PaYS Program guarantees soldiers a job interview and possible employment after their service in the Army. The PaYS Program provides America’s youth with the unique opportunity to simultaneously serve their country and prepare for their future. Members of the media who wish to cover the ceremony should RSVP to Mr. Alun Thomas, chief, advertising and public affairs, Phoenix Army Recruiting Battalion at 602-254-1981 or alun.h.thomas.civ@mail.mil. GlobalTranz is a technology-driven freight brokerage company specializing in LTL, full truckload, third-party logistics and expedited shipping services. GlobalTranz is leading the market in innovative logistics technology that optimizes the efficiency of freight movement and matches shipper demand and carrier capacity in near real-time. Leveraging its extensive freight agent network, GlobalTranz has emerged as a fast-growing market leader with a customer base of over 25,000 shippers. In 2016, Transport Topics ranked GlobalTranz as the 12th largest freight brokerage firm in the U.S. For more information, visit permissible-script.flywheelsites.com and follow us on LinkedIn and Twitter @globaltranz.